Available on Looking For A Sign. How can I tell what's mine? "Looking For A Sign" showed up as a title under Beck's name in the ASCAP copyright database at some point in 2011. Then in 2012, it was announced as a song in the film Jeff, Who Lives At Home. 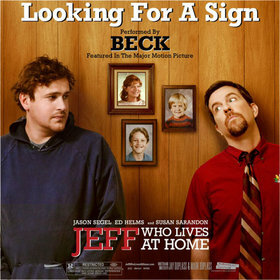 No soundtrack is planned for release, but shortly after the film came out, "Looking For A Sign" ended up a single on iTunes. The song is a straightforward and simple one, with banjo. While the straightforwardness may remind of Sea Change, especially in the starkness of the language, it does have a slightly different feel. Lyrically, the song wallows in the past, something that never really happened on Sea Change. That album was always frank that love was ending, and very sad over it. It is very much in the now. "Looking For A Sign," though, is a song in the past, someone haunted by his memories and, seemingly unrequited, hoping for it to return. I do not think Beck has written many songs like this before, though this song was clearly an influence of sorts. Just compare the first lines of "Just because I asked a friend about her / just because I spoke her name somewhere" to the first lines here: "if I ever think about her / if I ever call her name." Anyway, I like the clear and unadorned nature of the song, that part is similar to Sea Change for sure. It may not be his most charming track, but it is up there with his most emotive. Also, to note, there is some different musicians playing on this. Justin Meldal-Johnsen is on bass, like normal, but Cole Marsden Grief-Neill, played banjo and guitar (there are not many songs he actually performed on, though as one of Beck's engineers, he is credited on many). Also Brian Reitzell plays drums, and I don't believe he is on any other Beck songs (he's a noted soundtrack composer, and was in a band with Roger Joseph Manning Jr and Jason Falkner). Lastly, Tony Hoffer is an engineer -- he was a big part of Midnite Vultures and Guero, but don't think he had been around any other Beck music in about 5 years. Makes me wonder if this group did more that's unreleased? Or was this just a quick one-song, knock-it-out sort of situation?